These instructions inform you how to make payment for QRP Labs orders by bank transfer. PayPal and Credit Card payments options are provided and are the most common method of payment. 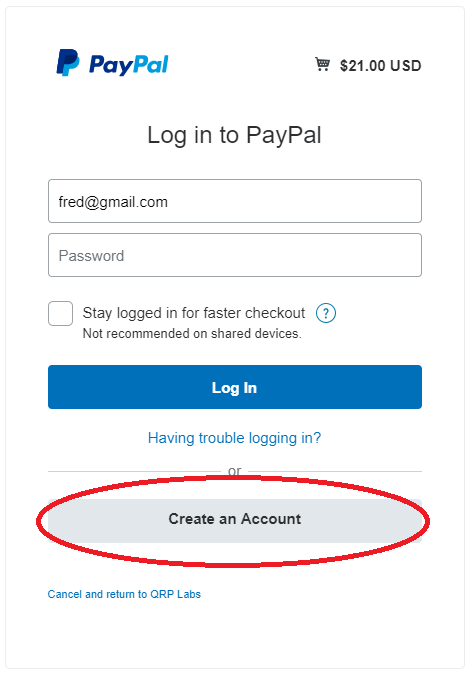 To pay by Credit Card (without a PayPal account), choose the PayPal option then checkout as guest; see below for details it will allow you to pay using your Credit Card, without having a Credit Card account. You can pay in Euros, Pounds or Dollars, as you wish. Click the icon at the top of the shop page to choose your currency. If you have already filled your shopping cart and entered your shipment address etc., you can still click the icon to change currency. Your shipment address information is preserved. When you complete your order, you will receive an email confirming the order. The order status will be "Pending". When we receive your bank transfer payment, we will match up the payment with your order amount (and name), and change the order status to "Complete"; you will receive another email confirming this. The order status will be changed to "Shipped" (and another confirmation email) once your order has actually been shipped at the post office. Account name: "TransferWise FBO QRP Labs"
We need to be able to match the incoming payment with the pending orders in the QRP Labs database. Normally your account name will match the name you enter on the QRP Labs order form and so this is easy. However if this is not the case, the information you enter in the payment reference field can be crucial. So please enter the name that you used on the QRP Labs order form. Some people don't have a PayPal account and want to pay by Credit Card. You can do this on the QRP Labs shop, by using the PayPal option as follows. 1) Select PayPal as the payment method in the shop checkout step 5. "Pay by Debit or Credit Card"
I am not sure why it sometimes says "Create an Account" and sometimes it says "Pay by Debit or Credit Card". But the result is always the same - don't worry, it does not really create an account for you. 3) Next you will see a credit card details page as follows, you can just fill this in and click to confirm, and the credit card will be processed. No PayPal account necessary.